Some people may tell you that a rock and roll lifestyle just isn’t feasible once you hit 40. They may tell you that from here on out its work, sleep, work repeat. But don’t listen to those nay-sayers. Don’t think of turning 40 as getting older. Think of it as a chance to party! Live it up when the big four-o comes around with this little list of glamorous 40th birthday ideas! The saying goes ‘age before beauty’. We say why not both? Treat yourself to a model makeover and photoshoot and live like the Cara Delevinges and Gigi Hadids of the world (If only for 3 hours!). During the first two hours the whole party will get to chat away with a glass of bubbly (depending on the location) whilst being glammed up by professional make-up artists. They don’t do hair unfor­tunately, but feel free to bring your own straig­hteners, wands or whatever else you might need! Then you'll be ushered to to a professional photography studio (complete with professional photographer!) where it’s time to unleash your inner model! You’ll take a number of group and individual shots however you want to. Bring some different outfits so they can capture your many looks, or even come in fancy dress! It’s your shoot, your way! The price of the photos is included and you’ll be able to find them online (images usually sent within 3-5 working days), where you can download and keep them forever. Who doesn’t love a nice glass of fizz? Most of us love it a little too much! You know what else everyone loves? Nibbles! 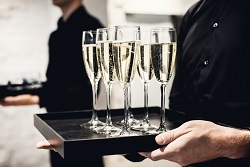 Finger food and fizz parties are wonderful 40th birthday party ideas that’re perfect for lunchtimes, afternoons or prinking with friends before the real night begins! There’s nothing like a good drink with even better friends, especially when delicious bitesize food is added! It doesn’t get more than glamorous than strictly, so what better way to celebrate a glamorous 40th birthday than a strictly come dancing class? Put on your most dazzling dress, take your partners hand and learn a fabulous Latin ballroom dance routine with the guidance of an experienced instructor. Learn how to dance just like they do on TV! Well, maybe not THAT good. But it’s amazing fun regardless! 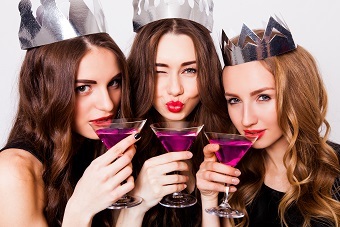 There’s plenty more glamorous 40th birthday party activities to make you look good and love life. Making your 40th your classiest birthday is a piece of cake. You don’t have to spend a million dollars to feel like it!